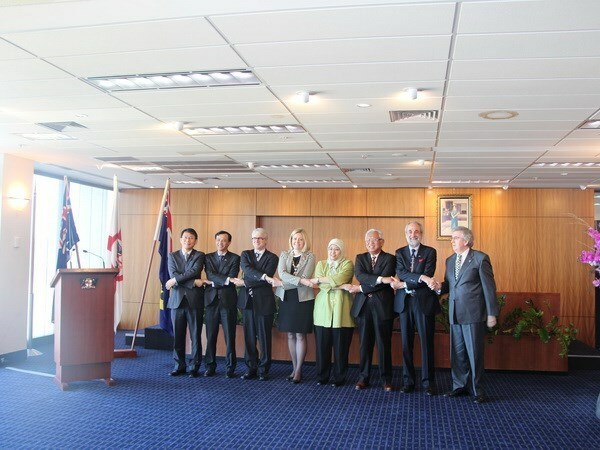 The Consulate General of Vietnam in Perth, Australia hosted a ceremony on August 5 to hoist the ASEAN flag ahead of the bloc’s 48 th founding anniversary (August 10). Speaking at the event, Treasurer Mike Nahan - who is also Western Australia Minister for Energy, Citizenship and Multicultural Interests - underscored the importance of ASEAN to Australia and the Western Australia state in particular. He hoped that both sides would promote cooperation in fields of shared interests and wished the ASEAN Community’s establishment would take place as planned. Lord Mayor of Perth city Lisa Scaffidi, for her part, stated that Perth is proud to be a gateway for links between Australia and the Western Australia state in particular with ASEAN, the world’s fastest-developing and most vibrant region. Vietnamese Consul General in Western Australia Le Viet Duyen informed guests on the progress of building the ASEAN Community and the bloc’s efforts to ensure an environment of peace, security, stability, cooperation and development in the region. ASEAN member states with representative agencies in Western Australia are among the state’s top 10 trade partners given the birth of ASEAN Community later this year, he said. Duyen also called on Perth authorities to reinforce ties with ASEAN cities and localities.